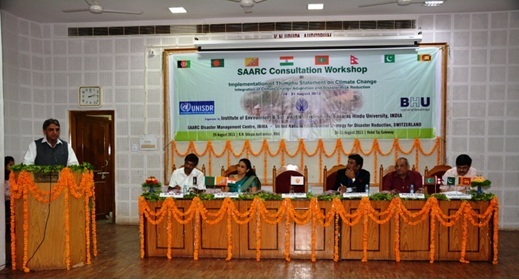 A three days SAARC Consultation Workshop on �Implementation of Thimphu Statement on Climate Change: Integration of Climate Change Adaptation and Disaster Risk Reduction� was being organized by Institute of Environment and Sustainable Development, Banaras Hindu University, Varanasi in collaboration with SAARC Disaster Management Centre, New Delhi and United Nations International Strategy for Disaster Reduction (UNISDR), Geneva from 29-31 August, 2013. The workshop aims to implement Thimphu Statement on Climate Change by �A Comprehensive study of the policy, institutional landscape, and resource allocation for Disaster Risk Reduction (DRR) and Climate Change Adaptation (CCA) in South Asia�. The workshop provided platform to SAARC member states (Afghanistan, Bangladesh, Bhutan, India, Maldives, Nepal, Pakistan and Sri Lanka) on issues related to disaster prevention, preparedness & management, linkages with climate change adaptation. Additionally, the SAARC consultation workshop also brought together experts from Government, NGOs, academia and the UN organization for policy evaluation, institutional landscape and resource allocation/ convergence and divergence of policies and institutions. A state of art projections on projects already implemented for DRR & CCA was discussed. 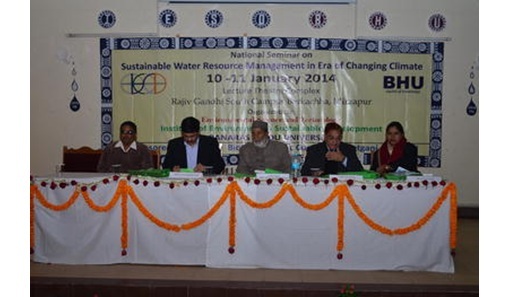 The National Seminar on Sustainable Water Resource Management in Era of Changing Climate (NSWRM-2014) on 10�11 January 2014 organised by the Institute of Environment and Sustainable Development and Environmental Science and Technology, Banaras Hindu University, witnessed the presence of experts from environmentalists, industrialists and experts on water resources and its management. The deliberations and scientific discussions led to the conclusion that it is not just the resource but the natural capacity to sustain it that requires monitoring, understanding and stewardship. The focus of governance in India needs to move at a faster pace from conventional methods of sector-based water management to more integrated approach for sustainable water resource management. It is more of the people participation that is the future key towards sustainable water resource management in India. Institute of Environment and Sustainable Development, Banaras Hindu University, Varanasi organized two days Graduate Seminar on Environment and Sustainable Development on 8 and 9th March, 2014 to provide graduate students a platform to discuss issues and challenges related to sustainable development of humanity in the era of fast changing environment. Students from various departments from both the campus of BHU (Main and Barkachha) and other universities participated in the seminar. 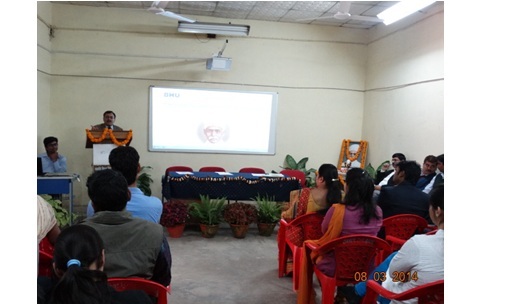 Specialized lectures covering various aspects of environment and sustainable development i.e. Statistics, Instrumentation, waste management, remote sensing and GIS was delivered by invited faculties and these was interaction session also. Dr AnandVardhan, Director Academic Staff College, BHU inaugurated the seminar and he gave a useful talk on need of seminar especially focusing only students and importance of Environment and Sustainable Development.